We are a German-Greek family and are running our small equestrian farm since 1998. Starting with five horses, meanwhile their number increased on ten. In addition there are goats, chicken, rabbits, cats and dogs on our farm. 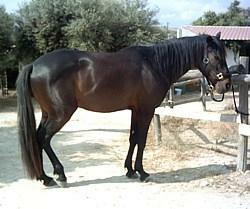 The horses belong to different races, mainly however of the tough, small "Messara Horses". 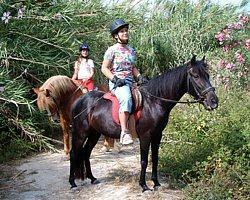 This age-old Cretan horse race is characterised by its tolt skills and its generally very soft courses in all paces! On our equestrian farm, situated on a hill at the edge of Pitsidia, a small village about four kilometres northeast of Matala with its famous caves, you can enjoy the fantastic view over the Ida mountains. 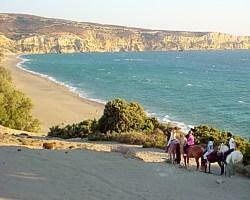 From our stables it's only a 30 minute walk by the fields and dunes up to the famous Komo Beach, one of the most beautiful (sandy) beaches of Crete.